At UNHInnovation (UNHI), the main goal of the Intellectual Asset Management team is to get UNH-derived ideas out into the world and maximize their social and economic impact. The university’s research expenditure of over $100 million creates positive institutional and social change and helps cement UNH as a world-class research institution and economic engine. Our commercialization efforts disseminate the hard work and years of research conducted by faculty, staff, and students, which attracts new research partners and avenues for funding. Intellectual Property (IP) is a set of intangible rights attached to many products, including materials, writings, technologies, processes, or programs, and may be protected under patent, trademark, and/or copyright laws, and sometimes by contract. Traditional “tech transfer” (the process of transferring scientific findings from one organization to another for further development and commercialization) typically uses the word invention to describe the IP being commercialized, but the word invention often has a limiting technical connotation. Researchers at UNH are doing groundbreaking work across the campus in the liberal arts, social sciences, STEM fields, and more. By using the term innovation, we hope to broaden the scope of the tech transfer conversation at UNH to include all works, whether they could be protected by copyrights, trademarks, or patents. Over the past few years, some of the innovations that have generated the greatest social impact and highest revenues have been evidence-based curricula, training programs, logos, and images. Submitting a disclosure of your innovation to UNHI is the first formal step in obtaining proper IP protection and commercializing your innovation. You are strongly encouraged to submit innovation disclosures early in the development process to avoid any potential problems. Commercialization demonstrates successful funding outcomes and broader impacts of the funded research to sponsors. These factors are gaining importance in requests for proposals and solicitations. In addition, UNH’s ability to manage IP is fundamental to developing successful industrial partnerships. Commercialization is frequently a component of the terms and conditions that are accepted with federal funds and could contribute to a sustainability plan required by external funders. Commercialization can generate personal income or funds to support research programs. Funding opportunities may also be created through sponsored research agreements for additional development work or related projects. UNH’s mission includes teaching, research, and outreach. Commercialization is one more means for our research to reach and benefit the public and create experiential learning opportunities. Use of the right contractual vehicle (from exclusive licenses to Creative Commons and open source licenses) helps to ensure that the value and quality of your evidence-based findings are not diluted by others, intentionally or otherwise. It also helps to ensure that attribution is always required, and it can provide a way to track the use of your research. Federal law requires the university to disclose patentable inventions, protect IP, and engage in tech transfer activity when any portion of its research funding comes from the U.S. government. UNH policy further expands this to include all innovations, whether they are patentable inventions, tangible research products, creative works, software, or trademarks. The innovation disclosure process is the first step in meeting federal requirements and it is the responsibility of UNH researchers to disclose all IP that could constitute innovations to UNHI. 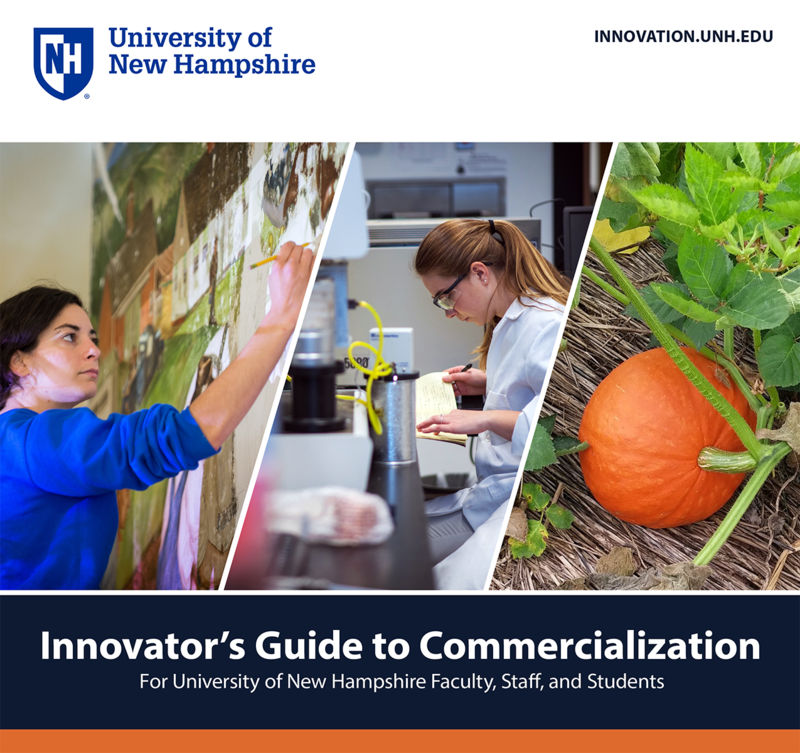 The UNH Innovator’s Guide to Commercialization details how UNHI can work with you through each step of the commercialization process, provides clear and concise answers to frequently asked questions, and points you in the right direction to find additional information and guidance. We encourage you to use this guide and our expertise to consider applications of your research in solving real-world problems, to begin the process of protecting your ideas and innovations, and to share your accomplishments as widely as possible.